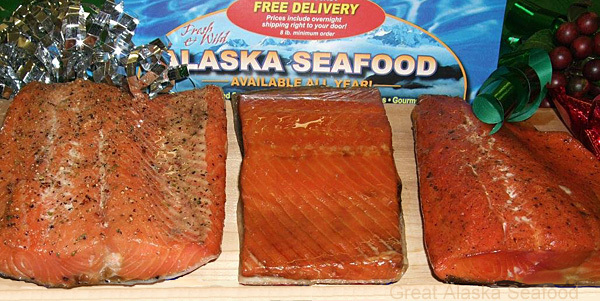 For all tastes and ages: All-Wild Alaska Smoked Salmon PLUS Assorted Chocolates. Shipped FREE to your door. For the smoked salmon lover who enjoys a variety of Traditional Smoked Salmon, Smoked Garlic Pepper Salmon and Cajun Smoked Salmon. All three smoked salmon choices have an assortment of Alaska King Salmon, Sockeye Salmon and Silver (Coho) Salmon depending on availability. Our smoked salmon is one of a kind, 100% natural never with any preservatives, nitrates or sulfates. Slowly Smoked with our cherry wood chips to create that melt in your mouth richness and flavor that you can only get from smoking Alaska's Wild Salmon the traditional way (with no liquid smoke flavoring). Also includes assorted chocolates to satisfy that sweet tooth.